Single Tier or Double Tier walk in style lockers are perfect for storing tenants’ out of season belongings. Double-Tier lockers are ideal for buildings with limited space but a large number of residents. rent storage lockers to tenants at typical rates and you may recoup the cost of the storage lockers and installation in one year. 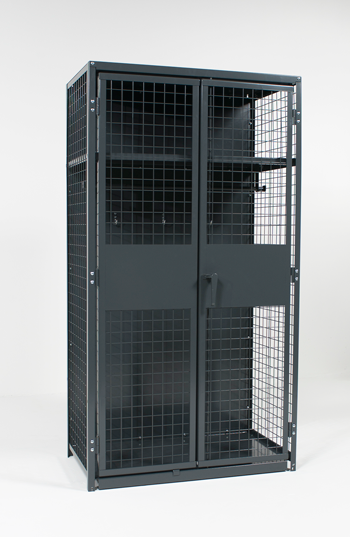 WireCrafters tenant storage lockers are made of 10 gauge wire in a 2″ x 2″ square welded wire mesh. This mesh is welded into a 1 1/4″ x 1 1/4″ x 13 gauge rolled formed angle. The storage locker’s open but secure design allows existing lighting, ventilation, and fire suppression systems to function effectively throughout the secured storage areas. WireCrafters has supplied TA-50 Military Storage Lockers and other types of storage solutions for the demanding requirements of the military and other government agencies for years. Our storage lockers are built to last. All of our Military Storage Lockers can be customized and configured with different options and accessories within the lockers. Typically, these storage lockers come equipped with a double hinged door on the front of the locker featuring a three point lock. The TA-50 Storage Locker’s standard size is 24″ deep x 42″ wide x 78″ high, but custom sizes are also available. The wire mesh on the front and sides of the locker is 2″ square 10 gauge welded wire or 1 1/2″ 13 gauge flattened expanded metal. Other meshes or expanded metals are available. WireCrafters RapidWire™ Industrial Storage Lockers are a perfect solution for securing employee items or company equipment. Stored items are not accessible, but remain visible when placed inside the storage locker. The open but secure welded mesh design allows in-plant lighting, ventilation, and fire suppression systems to work effectively throughout the storage area. Industrial lockers can be installed individually or in groups, and can be configured to have one to four compartments. WireCrafters Industrial Storage Lockers set up fast, and can be moved or reconfigured as facility needs change. RapidWire™ Industrial Storage Lockers are not meant to replace personnel or school-type lockers; school-type lockers are for storage of your smaller personal items. 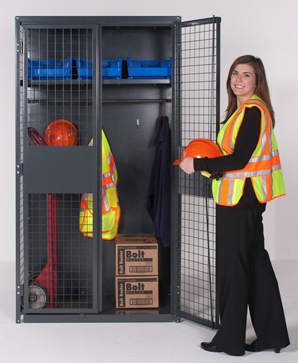 The RapidWire™ Industrial Storage Locker is for those items you use within the work area. They are designed to allow you to store large parts and specialized equipment that you are responsible for. WireCrafters has supplied RapidWire™ storage lockers to companies that have outside technicians.